Using a cleaver or heavy knife, cut each wing at its three joints. Set aside the drumettes and second joints for this recipe, and reserve the wingtips for another use (such as making stock) or discard. In a small bowl, whisk together 3/4 cup of the caramel sauce, the soy sauce, chile sauce, salt, peppercorns and garlic to make a marinade. 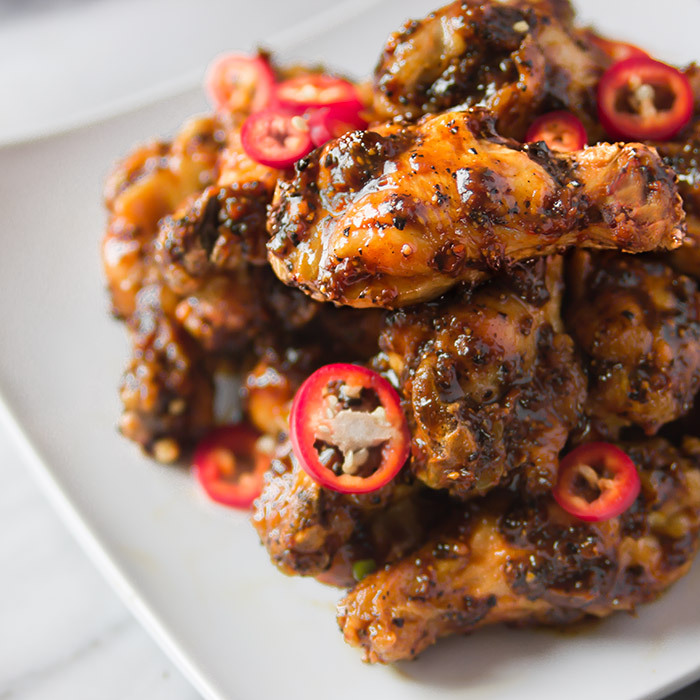 Place the chicken in a lock-top plastic bag and pour in the marinade, coating the wings evenly. Squeeze the air out of the bag and seal it. Refrigerate for at least 12 hours or up to 24 hours, turning the bag occasionally. Preheat the oven to 375°F. Line a large rimmed baking sheet with aluminum foil. Place a large wire rack on the baking sheet and coat with cooking spray. Put the wings in a colander to drain off the excess marinade, and then arrange them on the rack on the baking sheet. Roast until the skin is crispy and a deep mahogany and the meat has begun to pull away from the bone, 35-40 minutes. Remove from the oven and transfer the wings to a large bowl. Drizzle the wings with the remaining 3/4 cup caramel sauce and toss. Return to the rack on the baking sheet and cook until the wings are freshly glazed, about 6 minutes. Transfer the wings to a serving platter, let cool just slightly and then serve.